According to mythology, the girl name Gira (originally Sanskrit) means speech, voice and language, word, song or Vedic hymn. Gira is also one of the names of the Hindu Goddess Sarasvati. As per USA popularity chart is not shown, name Gira is not popular in the USA. As per social media profile counts, Gira is a bit popular name in India. Gira is used by less than 35 people in India as the name of their kids. In our opinion, Gira is Short, Sweet and Unique name. Gira also has Very Good Meaning attached with it. Name Gira have mythological significance. 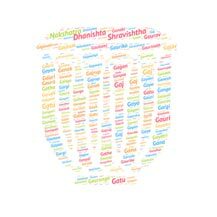 If you are looking for a name which is unique, short and easy to pronounce to non Indians, then choose name Gira as the name of your baby. The Sanskrit word Abhiram(अभिराम) means delightful, beautifu..
Gavendra (Hindi: गवेन्द्र) is a common Hindu name for boy. T..